For your basic scrambled eggs start by cracking some eggs into a bowl. 3-4 will be enough for 2 adult sized portions. Add a few tablespoons of milk and then a pinch of salt and pepper. Whisk well to bring the mixture together. Melt 2 tablespoons of butter in the bottom of a large non stick saute pan over medium heat. Tilt the pan to ensure that the entire bottom is covered with butter. Then, pour the egg mixture into the pan and as they begin to set gently pull them across the pan with an inverted spatula or wooden spoon. Continue lifting the eggs and folding them until the mixture has thickened, cooked to soft large curds and no visible liquids remain. These are a bit harder to get right but if you concentrate on the every little detail practice will make perfect. Start by putting water in a large saucepan. It should be about 2-3 inches high. Add a teaspoon of vinegar and a sprinkle of salt. Bring the water to a boil and then lower it to the point where it's just barely bubbling. Hit the egg lightly on a hard surface and then hold it right above the water cracking it open very carefully and allowing the egg to slide right into the water. You can break the egg into a small coffee cup and then lower it into the water if you find that more comfortable. Cook the egg until it's white is completely set and the yolk is still soft. The timing should be about 3-5 minutes. Gently remove the egg from the water with a slotted spoon. Allow some of the water to drip out and then place it on a paper towel lined plate to drain further. Once your poached eggs have been drained you can top toasted pieces of bread with them, drizzle them with sauce or sprinkle them with herbs and serve. Remove your eggs from the fridge 30 minutes before cooking them so that they can come to room temperature first. This will prevent cracking. Then place your eggs in a single layer in a large saucepan. Add enough water to cover them by an inch. Bring the eggs to a boil over high heat. Immediately remove the pan from the heat and cover it with a lid. The residual heat in the water will continue to cook the eggs through. Timing is key here. For extra large eggs give them 15 minutes to cook, for large eggs give 12 minutes and 9 minutes for medium sized eggs. If you want to soft boil your egg 3-5 minutes will be the amount of time to go for. Once the proper amount of time has passed, drain the eggs. Submerge the eggs still in the pan in ice cold water. 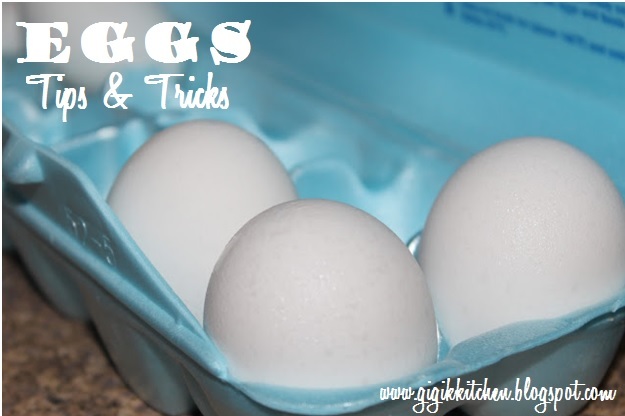 Set it aside so the eggs can cool then peel them and serve. Do you want to check if your eggs are overcooked? Eggs that have cooked longer then necessary will have a green ring around their yolk which is the sign you should look for. Fun Fact: Unpeeled hard boiled eggs can be kept in the fridge for up to one week. If you've already peel them they can still be stored in a covered container in the fridge submerged in water. They can stay fresh this way for 3 to 4 days. Sunny side up/Over easy- these eggs are very similar to scrambled eggs and omelets cooking wise. All that needs to be done once your skillet is heated and butter melted is break your egg gently sliding it into the pan much like you would when poaching an egg. Reduce your heat to low right away as gentle heat ensures even cooking and keep the eggs from going tough and rubbery. Cook slowly until the whites are completely firm and the yolks have begun to thicken but aren't yet hard. Omelets are similar to scrambled eggs with just a few switch ups. Prepare your raw filling ingredients before starting on your eggs by precooking and seasoning them to your liking since the omelets will cook fairly quickly. Crack two eggs into a bowl and add in a few tablespoons of water along with a pinch of salt and pepper. This will make one adult sized portion. Melt a few tablespoons of butter in the bottom of a large non stick skillet over medium-high heat until it's hot and foamy. Tilt the pan to ensure that the entire bottom is covered with butter. Add the egg mixture to the saute pan and notice that it sets almost immediately around the edges. As the eggs start to set, push the cooked edges carefully towards the center allowing the uncooked portion to flow underneath. Repeat this until the eggs are set and there is no visible liquid. Spoon your filling onto one side of the omelet- 1/3 of a cup to 1/2 cup of filling will suffice. Then top with cheese to keep the sides sealed together if you like. Fold the empty side up over the filling, and continue cooking till desired donenness is achieved. Once it is ready simply slide it onto a plate and serve. If you love eggs but find the cooking process tedious then an egg timer would certainly be really useful. When short on time it will cut out the extra guesswork. The Eggperfect Egg time from Crate & Barrel looks like a really helpful cooking companion! I hope to pick one of these up sometime soon for my own kitchen. Do you have some tips for cooking eggs perfectly or a recipe for a delicious egg dish to share? Leave it in the comments form below, we can all use some more ideas and information!